Men’s Wear has a huge influence on Women’s fashion these days. Sometimes you’ll see head-to-toe men’s wear looks. I love the Men’s Wear inspired looks. I love the mix of masculine and feminine sometimes…especially when you’re wanting to feel extra powerful…I think it helps. 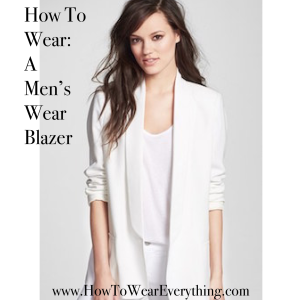 From day to day, if you want try just the blazer, here’s how. There are two ways to wear these: 1. Oversized 2. Fitted. 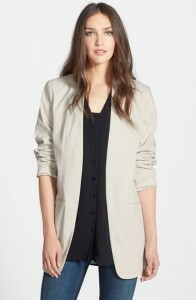 If your blazer is oversized, it should only be slightly oversized in the shoulder, then longer than normal. Everything else you are wearing should be more fitted, skinnies and a blouse. If you wear baggy with baggy you’ll start to look homeless. Think “opposites attract”…baggy with fitted, fitted with baggy…just like my other rule – covered arms with bare legs, covered legs with bare arms. These small rules will amp up your chicness and classiness by 200%, no prob. I imagine wearing an oversized men’s wear blazer with skinny jeans, a semi fitted blouse tucked in the front of the jeans, and chunky heels (to help balance out the top half of you being “heavy” with your oversized blazer). Comprende? This right white one is my favorite! They are great for those fall days that you need a little bit of extra layering. Even better when you can bunch up the sleeves. So cute! If your men’s wear blazer is fitted or semi fitted, it will automatically look dressier. These are the ones you can wear with some great slacks and pointy toe heels for a night out on the town! The blazer should hang just right when done up, with NO pulling anywhere. When clothes are pulling, it gives off the impression that you don’t fit in your clothes and that you are bigger than you are, even if you’re tiny! This is especially important to remember when you’ve got a bigger chest. When clothes hang right, and don’t pull, they’ll make you look slim and sleek. That’s what we all want, right? 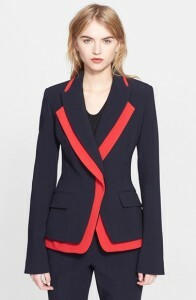 I also believe this type of blazer should be longer than a normal “wear to the office” blazer. See pictures. It’s not a Men’s Wear blazer if it’s not longer than normal. It should also come in at the waist a little, to give you some shape! Nothing too boxy. You still want to show your shape. I like them paired with slacks, also skinny jeans, or you can also pair it with a cute pair of matching shorts! Dress up with a heel or dress down with pointy flats or wedges. Super cute! A blazer that’s too small! 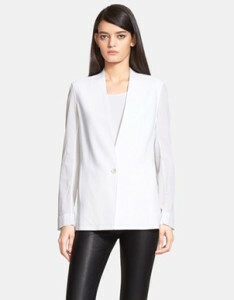 A blazer that’s too short (then it’s not a Men’s Wear Blazer, right?). One that’s too boxy. You are still a woman. Show off your curves! I like to add jewelry to a men’s wear look, with easy hair like these girls have. 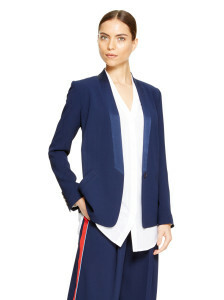 The jewelry adds a little more feminine touch, to go along with the masculinity of the blazer. Follow these simple rules and you’ll look great! !